Lovely many colored drought-tolerant Cosmos blooms spring through first frost! The most fabulous choices to grow are a diversity of flowering multipurpose companion plants with your veggies! If that includes being a native plant, hallelujah! 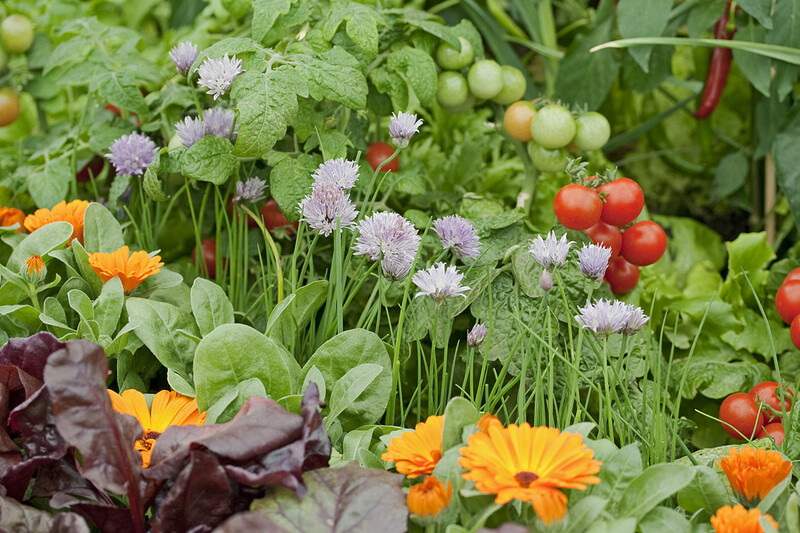 Companion Planting maximizes your connections! Companions plants may be other vegetables, like Radish! It is grown for the bulb, can be planted as a living mulch understory, can be let to grow up among cukes and zukes to repel cucumber beetle, is a trap for flea beetles, makes lovely edible flowers! We eat Cilantro leaves, it repels aphids, it’s flowers attract pollinators, the seeds become Coriander on your spice shelf. Some companions are colorful! Calendula! Chamomile is bright beauty. Arugula and radish flowers are delicate and detailed! Some flowers are total dainty princesses – cilantro, carrot and celery, the three Cs! Let arugula, cilantro, chamomile, a carrot or two, and a celery go to flower summer through fall to bring bees, butterflies and beneficial insects – pollinators! Besides being beautiful and having lovely scents, let them seed out for seeds for next year’s plantings, to share at the seed swap, give as gifts! Carrots love being with cilantro and chamomile, and chamomile improves the flavor of any neighboring herb! And what if they are not companions?! Grow beauty for the pollinators just because you love beauty and your special little friends! Flying insects are the most common pollinators. A special note about the importance of Bumble bees! Honey bees DON’T pollinate tomatoes, peppers, potatoes, eggplant or blueberries, but bumble bees DO! Bumblebees do what is called buzz pollination, sonication! Please see all about it in Sue Rosenthal’s post at Bay Nature! See the PBS Bumblebee Buzz Pollination video! Be careful with those lovely hybrids, especially ‘double-blooms.’ A slight change in scent or shape and your pollinator may not be able to recognize them. Design for Habitat and No Pesticides! When you are thinking where to put things, select permanent spots for herbs, gateway points for flowers and edible flowers! Designate a permanent patch for year round flower habitat for bees. Cilantro is both tasty and has lovely feathery leaves and flowers in breeze, great pollinator food. Chamomile is downright heady scented on a warm morning. Comfrey, Knitbone, is both medicinal, healing (arthritis/bones), and speeds your compost, is high in soil nutrition. Poppies are beautiful; humble white Sweet Alyssum is dainty and attracts beneficial insects. Calendula traps aphids, whiteflies, and thrips! Marigolds are brilliant and called the workhorse of pest deterrents! Cosmos is cosmic! Breadseed Poppies will literally have your bees rolling in pollen! Prairie Nursery in Westfield WI says: Pollinators are attracted to blooms that fit the pollinators’ physiological traits – specifically the length of their tongue. Some bees are generalists, flitting among flowers to drink nectar and collect pollen from many plant species. Flat or shallow blossoms, such as asters or coreopsis, attract a variety of bee species. But long-tongued bees will be attracted to plants with deeper nectaries and flowers with petals that form long tubes. The inclusion of a variety of floral shapes [and sizes] attracts a more diverse array of pollinators. Grouping plants in clumps of three or more attracts bees to the plants and allows them to forage efficiently. And don’t forget the water. Pollinators get thirsty while they are working in the sun! They like shallow water sources. A shallow birdbath with stones in it is perfect! 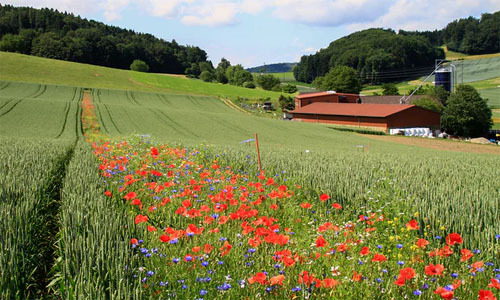 Farmers are planting wildflower rows! See Stripes of Wildflowers! The stripy fields have been planted across England and other countries as part of a trial to boost the natural predators of pests that attack cereal crops and potentially cut pesticide spraying! Plant flowers among, alongside, your veggies! 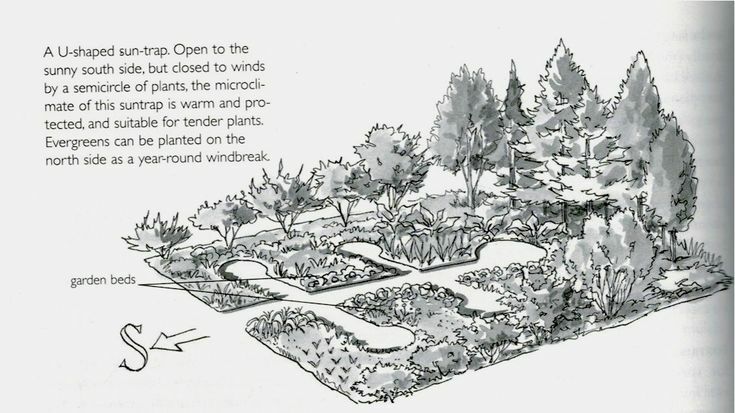 In fact, plant your flowers right in the center of things where they can serve several plants at once! Make that a short walk, or fly, for your beneficial insects! You may not plant stripes six metres wide, but do grow plenty of flowers the length of your area! All Season Support! Text for images from UCDavis Arboretum post for native California bees! Some bee species are active all year, others only in April and May, still others in July and August, and all need food! New queens are born in the fall, and after breeding they may find a place to hibernate for the winter. When they emerge in spring, they need nectar and pollen sources—or they can’t start their colonies. California poppy, Eschscholzia californica is technically an annual, but they will “perennial-ize” by sprouting the following year from their roots and lower stems or by re-seeding. Look for sweat bees scrambling around the bottom of the flower and covering themselves with pollen. Check out Renee’s California Poppy seed scatter can! Germander sage, Salvia chamaedryoides blooms with beautiful dark blue flowers from late spring to early summer and again in fall. It is a primary nectar source for a number of bee types. Male carder bees may be most noticeable as they set up territories around flowering patches and knock into other bees that enter their area. Deadheading spent flowers in early summer will help the blossoms (and the bees) return in fall. Grow host plants for butterfly & moth caterpillars too! Some are quite particular, even to only one kind of plant. Don’t forget the other littles! Butterflies, midges, beetles! Wasps, ants and flies, even slugs! Some of them will make you more happy than others, but thank them too for pollinating! Bird pollination even has a name, Ornithophily! In the US, hummingbirds are key in wildflower pollination. About 87% of flowering plants are pollinated by animals. These include wild flowers and those used by people for food and medicine. While many ground plants benefit from small mammals’ pollination, some flowering trees rely on similar relationships with tree-dwelling or flying mammals. Bats are probably the best known mammal pollinators. Hundreds of plants rely on these busy, flying nectar lovers to spread their pollen at night. The ‘little dragons,’ lizards and skinks, not only pollinate, but eat insect pests! Flowers are much more than a pretty face! They are habitat. That means food and shelter, moisture – the morning dew, and for many wild bees, a place to sleep at night! You don’t always see them because they generally get up earlier than Honeybees. First and foremost, just because your flowers are done, doesn’t mean beneficial insects don’t still need food and living quarters. Be more conscious about planting permanent habitat for them. Plus, if you have year ’round habitat, they will be ready to work for you as soon as your plants are up! Stripes of Wildflowers says they plant oxeye daisy, red clover, common knapweed and wild carrot. Likely they carefully chose those plants for the results hoped for. This combination probably serves the majority of common beneficial predators, large to small, needed to replace those pesticides. Oxeye daisy is a pretty little perennial – grows year after year, no replanting necessary. Depending on your climate, Red Clover, a legume, is a perennial that has the added advantage that as they die they also feed the soil the flowers are growing in! Common knapweed is a tall, thistle-like grassland perennial that doesn’t like wet areas or acidic soil. Wild carrot (Daucus carota), also known as Queen Anne’s lace, is a biennial plant in the parsley family. The flower head has trillions of tiny flowers! It is perfect for smaller beneficial insects, strongly attracts Syrphid flies aka Hoverflies! The common factor here is by planting perennials and self-seeders, there is always habitat, and no replanting necessary! Though Wild carrot is a biennial, it self-seeds like crazy, keeping a constant supply of flowers! Your choice of flowers, that insects love, that bloom all year long and are there all the time, is garden wisdom! Honey bees have their hives, but native bees don’t. Most species of wild bees are solitary, and some 70 percent of them dig a nest in the ground to raise their young—something they can’t do if mulch is in the way. Leave a little bare ground and protect it from being stepped on! No mulch needed! They favor a slight slope or well drained site. Install some living quarters, a bee block or bee hotel, which are available online or at some garden stores. Bee hotels are a pollinator’s paradise! Pollinators’ housing needs are hugely diverse! 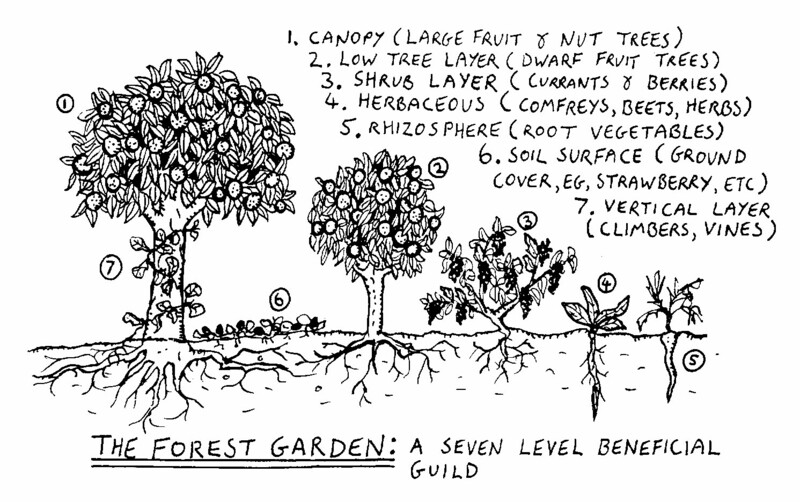 Bare soil, hollow twigs, big holes in trees, little holes of only a certain depth. You could also drill holes of varying sizes in a dead tree that’s still standing (if beetles haven’t already done it for you). You can easily build them yourself! They can be simple and small or a luxury condo like this one! See more! Please see these super useful detailed tips here! Put your bee home up in March or early April! This will offer prime nesting sites for solitary bees for laying their eggs. Soon they will be buzzing, hovering and feasting about your veggie garden! Plant their favorite flower foods in time to feed them! See more about their favorite food! Jennifer S Holland, writes for National Geographic: Learn more about organizations that support pollinators and their habitats, such as Pollinator Partnership. You can also participate in citizen-science programs for pollinators such as Bumble Bee Watch (Xerces Society), The Great Sunflower Project (San Francisco State University), Fourth of July Butterfly Count (North American Butterfly Association), and the Monarch Larva Monitoring Project (Monarch Watch). • A 25% uptick in participation in its forum, “Gardening for Bees and Butterflies. • A 45% increase in searches relating to pollination. • 140,000 photos of pollinator-friendly plants and pollinators uploaded. For those of you with space for shrubs and trees, find out the best varieties to seasonally support our precious pollinators all year long! If you don’t have big space, plant your mini bloomers in containers, on your apt balcony, wherever you can! Don’t forget to plant the street strip with drought tolerant abundantly flowering native plants, buckwheat might be one! Check with your local nurseries that support pollinators, local botanic gardens, master gardeners, for the best plant choices for your area. Sharing is Caring! Put up your conversation starter informative sign. Be proud & happy! Plant significant, do-the-job flowers for bees, the colors they love the most! Plant for pollinators of all kinds, plant for the good-guy predators! Do it in your yard, in your veggie garden, along the street! Make your life a lovely Meadow! Time to start compost for spring planting! Did you make rich fall soil? If so, your bin and sheet composting is really paying off now! If you have more compost available now, incorporate it with the soil in your new planting places, and plant another round! Keep ‘em coming! 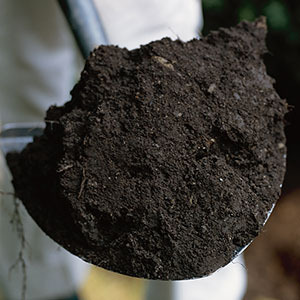 Now it is time to start the cycle again for your spring garden – start some more fat compost! SOIL! I’m always talking with you about soil because it’s the legs of your horse! Can’t run without it! When you restore, recondition soil, you can imagine how much the ground must be welcoming you, screaming up to you in its own way, how grateful it is to be so lovingly fed, organically to boot!!! You are going to have wonderful soil, and very soon! Just the act of planting adds life, the plant roots busting through, little creaturelets thriving! There are so many ways to build wonderful soil! Tuck kitchen trim in the top 6” of your soil, where the microbes and buglets are hard at work! Make piles and fill bins with compost from kitchen trim, cuttings, leaves, straw for aeration. Whack it up! Smaller pieces, thinner layers decompose faster and fluffier. Dry brown on the bottom, then up and up, alternating layers. 1 green wet, 2 dry brown, 1 green wet…. Sheet composting – build your compost in place, no moving later! Lay down straw, cover with green and wet waste like kitchen trim, cover with straw. That would be the simplest of all. If you can, keep layering, up to 18” deep if you are starting raised beds, because you know that stuff is gonna sink down! 2 brown dry to 1 green wet is the formula. 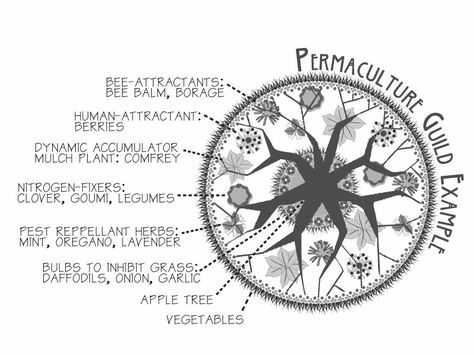 Inoculate it with soil microorganisms by flinging a few handfuls of nearby soil onto it every couple of layers. If you have them, put some red wriggler surface feeding worms in there. They will chomp about and add their castings for free! If you are seaside, chop up some seaweed for trace minerals! Plant Nitrogen fixers – fava, peas, beans, clovers and other ground cover legumes. At home plant Leucaena trees! Not only do they fix N, and are drought tolerant, but the young pods are edible! Be warned though, they grow FAST, and can be invasive – if you aren’t ready for that, like burning them for firewood, not a good choice. Let your local livestock, goats, chickens, bunnies add their part! Horse manure has more N than cow manure. For excellent info and fun reading, check out the scoop on poop, Manure Matters! by Marion Owen, Co-author of Chicken Soup for the Gardener’s Soul. Frane says: Trees benefit most from the nutrients available in their own leaves. Most leaves beat manure for mineral content; when incorporated into the soil, they add nutrients, improve aeration and soil structure and encourage earthworms. So don’t rake leaves up and throw them away! Leaves are not garbage, they are an important food for your soil! Planting immediately and directly in your sheet composting, lasagna layers? Of course! Are you doing seeds? Ok, a little preparation is needed. Time for a little potting soil. It’s good to get the seedlings started – it has the water holding capacity they need – just like the little transplants you get at the nursery, which they feed, probably daily, kelp, fish emulsion mix, other concoctions. After that, seedlings have to hit something with real nutrition in it, like a mix of compost and soil. Most seeds are planted directly in soil, just like Mother Nature does the job. That’s where they immediately get the most nutrition. I would get a deep bowl, a bucket, put in ½ soil, then compost, mix it up. Put the mix in the planting hole, make a little hole for the potting soil, and put your seeds in that. No more potting soil than if you were filling up one of the little transplant containers. Obviously, not a lot would be needed. To keep the soil from falling through the lasagna layers below, you could line the hole with two or three sheets of newspaper, saturate them. That will keep things where you want them until it all decomposes together, the newspaper, the lasagna. It won’t hurt your drainage, and little roots will poke right through! And you are only going to lightly sprinkle, water, your seeded areas, right? You don’t want your seeds to wash away, get buried too deep or uncovered. It’s a good thing to check seedlings after a rain. Recover or rebury anyone who needs it. If you are doing transplants, you just won’t need any potting soil. Make your compost/soil mix and pop your cute little transplant right in there! Take good care of yourself…and your soil. February 2011 Santa Barbara CA Area Garden Events! The 3rd Annual Seed Swap was a great success! I found some great fava beans donated by Tom Shepherd, Shepherd Farms. I’m still looking for some jicama seeds. There were wonderful talks, was lively music, new friendships made, and, of course, seeds gathered for mighty planting! If you didn’t make it this year, be sure to come next year! Feb 5 Banana Plantation & Mulching Party at Mesa Harmony Garden! 8 AM to 1 PM, Holy Cross Church, Meigs/Cliff Dr. Wheelbarrows, picks, pitchforks, shovels needed – bring if you can! Over 100 fruit and nut trees have been planted already, now it’s BANANA planting time! Come see the 34 plot community garden and the project! Get inspired! Feg 14 Happy Valentine’s Day! Feb 19 The Seed Ball Making Party! 11 AM to 4 PM at Plaza de Vera Cruz – across the street from the Saturday Farmer’s Market, where Sol Foods Festival was. If there is rain the new location will be posted on eatthestreet.org. If you have seeds to share, please do bring them. And bring some snacks or dishes to share if you wish! What is a seed ball? Think of them like this: Little Adobe Gardens Imagine then, a clay ball the size of a large marble. Imagine also that it contains seeds for a complete habitat. The seed ball could contain plant potential for an entire ecosystem. It can be made by anyone, anywhere in the world where there is clay, compost, seed and water. The ball is tossed wherever you want to plant, rain moistens it, the clay ‘melts’ its nutrients into the surrounding soil and blankets the seeds with minerals & vitamins. Covered & moist, they germinate, voila! Flowers! Or veggies! Feb 27 Santa Barbara Guerilla Planting Day! The Seed Ball Party is purposely planned to precede a day of Guerilla Planting, planting anything and anywhere, respectfully! Particularly it is emphasizing planting unused land – flowers or vegetables! Some people will be planting trees! Several downtown Santa Barbara businesses are already planning creative events! One brewery is going to plant Barley! Feb 26 10 AM Vegetable Gardening with Oscar Carmona La Sumida Nursery – Rain or shine. Class is free! Feb 26-27 Santa Barbara Spring Home & Garden Expo! HOME should be an experience, not just an address. Apr 16 & 17, CEC’s Earth Day Festival 2011! Give your Valentine a basket of veggies and some seeds to plant! Have a great month!